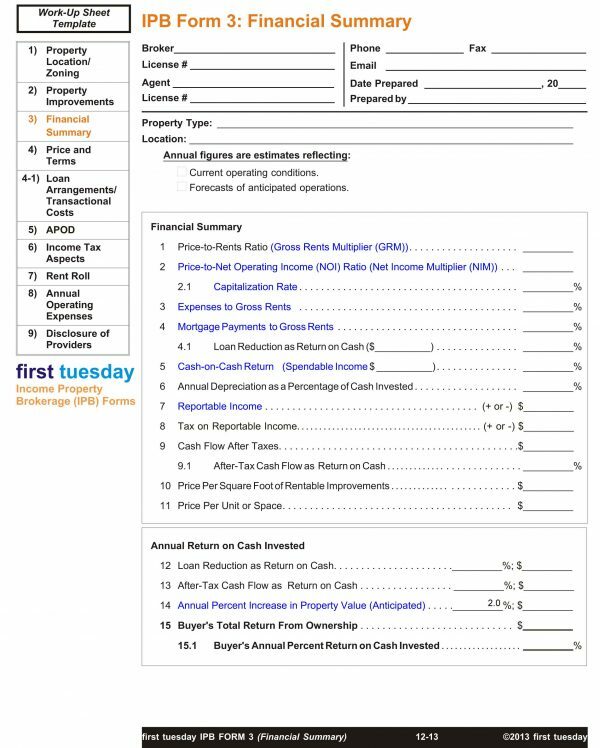 This suite of forms is used by an agent when preparing a marketing package for an income property they listed for sale, to gather information about the producing property for investor review regarding the property location, zoning, improvements, financing terms, income tax aspects, service providers, rent and expense data. the current, and if feasible, anticipated operating figures for the property. Buyer reception to the marketing package? Buyers also tend to appear at different stages in a business cycle from boom to bust and back. Investors and end users purchase property for the income potential or rent to be saved over the long haul of an ownership. They generally surface at the end of recessions, the early part of a recovery when property owners and tenants appear to be stabilizing from the disruption of a recent recession. For investors and users, the marketing package with its income and expense analysis section is the evidence they need of the property’s inherent fundamentals which support a flow of net income in the future. On the other hand, speculators acquire real estate for the profit it yields on a quick resale, tenants at current rents being a detriment. Speculators do not venture into the calculus of income, expenses, capitalization rates (cap rates), mortgage rates or tenant turnover to determine value. in a boom when sales volume momentum is dramatically driving prices up (to ride a pricing tsunami for a quick flip without concern for any sort of valuation analysis). Thus, with speculators, the package becomes the imperative line of defense for a seller’s agent against a speculator’s gamble and later loss on a resale. As the cause for their losses on a resale, they make claims of nondisclosure by the seller’s agent. As always, the last speculators in before sales volume gives out and prices tumble take losses, or they simply retain the property, adjust their business model and wait out the current downside in pricing. Either way, the seller’s agent has an increase in the risk of claims compared to those associated with an investor who has made a studied purchase decision based on data the seller’s agent produced in a package replete with the agent’s due diligence results. For investors, data presented in a marketing package is used to set the rate of return — the cap rate — justified based on the property fundamentals presented in the agent’s package. As always, a cap rate comprises the rate of consumer inflation foreseen by the investor, an annual risk-free and management-free profit margin on capital invested, plus a premium rate for risks of ownership unique to the property. It is well known that a buyer of income property needs data to act upon — no data, no action. However, far too many sellers’ agents tend to merely present their conclusions about the property’s operations, then move on to a friendly discussion about their listing, the marketplace and the current owner’s issues. A good marketing package avoids all loose talk — it presents the property in a self-explanatory format that is quickly digested by the potential buyer. The package functions as a full up-front operating and property disclosure. When timely delivered, the package allows a buyer or buyer’s agent to quickly form their own conclusions on whether the property’s historical performance meets their standards and investment objectives. If so, the yield they need on this class of investment opportunity quickly sets the price they will be willing to pay. Without operating data, the buyer is simply unable to set the price to be offered for a property — they are flying blind in the murky clouds of abstraction Popularly bandied figures, such as the gross rent multiplier (GRM),net income multiplier (NIM) or cap rate driven solely by the seller’s asking price are not particularly useful to attract buyers — insufficient for an analysis of property operations actually being experienced by the seller. To attract and retain the attention of the an investor who will ultimately close on a purchase of an income property listing, the seller’s agent needs to marshal data and information on the property’s current income and expense, and the condition of the improvements, and place it in the hands of all prospective buyers. Any talk on GRMs, NIMs and tax benefits are a stall, preventing prospective buyers from getting the operating figures and management information fundamental to setting a price that is reasonable for the property. Without this simple transparency, an asymmetry of information in a sales transaction exists which inevitably leads to a disagreement or dispute. Informed by their personal experience, the owner intimately knows about the operating costs of the property — but the buyer does not. To get to these figures calculated and properly presented, the seller’s agent, with the cooperation and help of the seller, engages in a little homework, completing their due diligence efforts and preparing marketing disclosures before they ever expose the property to possible buyers. Once gathered, the seller’s agent puts them into an effective format to make the operating figures immediately available to prospective buyers as part of the marketing package. The IPB package is comprised of several forms. Together, they present the fundamentals for buyer analysis of an income property. Preparation of the IPB package begins with the seller’s agent’s completion of the preliminary Work-Up Sheet Template, used to enter approximations of recurring amounts. Data entered in the Work-Up Sheet Template automatically fills in corresponding fields in all the IPB forms. Entries on the Work-Up Sheet Template are estimates automatically overridden with more accurate figures when detailed data is entered or calculated in other forms. Further, as the different IPB forms are filled out in detail, prior figures are automatically recalculated and updated. The Work-Up Sheet Template is for the agent’s approximations before getting into details. It is not intended to be a page included in the package handed to the owner or the buyer. The Financial Summary page brings the critical data from all IPB forms together in a concise and easy to interpret summary. With it, the investor is presented with all the various financial calculations used to determine a property’s value in one singular location in the series. Further, to inform owners and buyers about the significance of real estate terms used in the IPB forms, the seller’s agent includes the IPB’s Glossary of Terms in their final marketing package. Location: Enter as much of the requested information as possible in order to present an accurate and complete depiction of the area immediately surrounding the property. Much of this information can be obtained online and in person from the local Chamber of Commerce and Planning Department of the county where the property is located. Property Pictures: Click here for instructions how to insert PDF images into your form. Local Housing Info: Go to the Demographic Profile – California and Counties page of the California Employment Development Department (EDD) website. Select the county where the property is located. Enter the consensus data provided into the corresponding fields of the form. Average Annual Household Income: Go to the Demographic Profile – California and Counties page of the EDD website. Select the county where the property is located. Enter the consensus data provided into the corresponding fields of the form. Local Population: Go to the Demographic Profile – California and Counties page of the EDD website. Select the county where the property is located. Enter the consensus data provided into the corresponding fields of the form. Total Labor Force/Non-farm Employment: Go to the Labor Market Information (LMI) by County page of the EDD website. Select the county where the property is located. Select “Local Area Profile.” Enter the data provided into the corresponding fields of the form. Total Population ___ Years Ago: In the Local Area Profile section of the EDD website (see step above), select “Get More Info (Data Library)” under the “Population and Census Data” header. Select the county where the property is located. Under the “Select Years” pull-down, specify the years for which you would like to retrieve data. Follow the onscreen prompts to receive the total population for the previously specified years. Year Property was Built: Enter the year of the property’s construction. Present Use of Property: Describe the property’s current use, or the most recent use (if that use is still permitted). Highest and Best Use of Property: Describe the uses most suitable for the property. Indicate whether this use is permitted by current zoning without a conditional use permit. Zone Type: Enter the property’s zoning set by local ordinance. Uses Permitted: Describe what uses are permitted by the property’s zoning classification, as obtained online or in person from the Planning Department of the county where the property is located. Permissible Further Improvements: Describe any potential further improvements to the property permitted by the property’s zoning. Distance to a Change in Zoning: Give the location of the nearest change in zoning. Proximate Zoning Type: Enter the zoning type of the nearest area with different zoning. Proximate Uses Permitted: Describe which activities are permitted on other nearby properties with zoning different from that of the property. Attributes of Surrounding Area: Briefly describe any relevant features of the surrounding area, including neighborhood businesses, natural resources, or other local attributes. Property Improvements: Enter the requested information about the property, and provide a brief description of each requested item. 1 Number of Units: Enter the number of units or spaces available for rent on the property. 2 Unit Mix and Size: Indicate the type of units within the property (commercial, residential, condos, etc. ), and the number of units of each type. 3 Total Rentable Sq Ft: Enter the combined size in square feet of all rentable units and space. 4 Lot Size in Sq Ft: Enter the total size of the parcel in square feet. 5 Lot Dimensions: Enter the dimensions, in feet, of the property’s parameters. 6 Percentage of Ground Covered by Improvements: The constructed improvements, as a percentage of the property’s lot size. 7 Total Cost to Replace All Improvements: Enter the estimated total cost of construction to currently replace all improvements on the property. 8 Type of Construction: Briefly describe the type of construction and condition of the property’s structure. 9 Roof: Briefly describe the age, type and condition of the property’s roofing. 10 Plumbing: Briefly describe the type of piping and condition of the plumbing fixtures, sprinklers and fire system. 11 Water Source and Lines: Briefly describe the source of the water supply and the size of the meter. 12 Sewer Hookup: Note whether the property is hooked up to the local sewage system, and if not, briefly describe the sewage system servicing the property and its condition. 13 Fire Sprinklers (type/rating): Briefly describe the type and rating of the sprinkler system installed in the property. 14 Ceiling Clearance: Briefly describe the height of the ceiling. If the ceiling height varies, describe the height in each location. 15 Electrical Supply: Briefly describe the voltage supplied and condition of the property’s electrical system. 16 HVAC Units: HVAC stands for Heating, Ventilation, and Air Conditioning. Briefly describe any of the property’s equipment that falls into this category (number of units and capacity). 17 Cable TV: Describe any cable or other TV service to the property. 18 Internet: Describe any internet service to the property. 19 Pool Dimensions: Briefly describe any pool on the property. 20 Gym/Clubhouse Data: Briefly describe any gym or clubhouse facilities on the property. 21 Security Arrangements: Briefly describe any security systems or resources on the property, as well as any notable security risks. 22 Elevator/Stairs: Briefly describe the type and condition of any stairs or elevators on the property. 23 Flooring: Briefly describe the floor covering throughout the property. 24 Windows: Briefly describe the features and condition of the windows. 25 Number and Height of Ground Level Doors: Briefly describe the number and height of the ground doors on the property. 27 Ramps: Briefly describe the number of ramps on the property. 28 Parking Lot/Spaces on Unit: Briefly describe the number of designated and public parking spaces on or near the property and whether the parking lot is covered. 29 Landscaping: Briefly describe the property’s landscaping, including the watering system. 30 Fences: Briefly describe the type, location and condition of any fences on or around the property. 31 Lighting Adequacy (Inside): Briefly describe the type, source and quality of lighting inside the property. 32 Lighting Adequacy (Outside): Briefly describe the type, source and quality of lighting outside the property (i.e.,automated safety lights). 33 Easement: Briefly describe any easements encumbering the property. 14 Annual Percent Increase in Property Value (Anticipated): Enter the anticipated annual increase in property value due to inflation (or deflation), appreciation and improved management. 1 Down Payment: Enter the down payment amount sought by the seller. 2 New Loan Amount: Enter the dollar amount of the purchase price to be funded by new financing to be obtained by the buyer. 3 Assume Existing Loan: Enter the amounts of any existing loans on the property that the seller will permit the buyer to assume. 4 Seller Carryback Financing: Enter the dollar amount of financing the seller is willing to carry on a note executed by a creditworthy buyer and secured by a trust deed on the property, junior to existing or new financing. 5 Buyer Transactional and Loan Costs: Enter the dollar amount of the transactional closing costs (other than the price paid) and loan charges (other than prepaid interest) incurred by the buyer to assume or originate new financing. 6 Total Cost of Acquisition: Enter the dollar amount of all capital investments made in cash, loans, carryback financing and closing costs incurred by the buyer to acquire the property. This is the total of the previous one through six. 1 NEW LOAN ARRANGEMENTS: Check the box to indicate whether the new purchase-assist loan is a first or second. Fill in the data fields below based on any future purchase-assist financing the buyer will arrange to fund the portion of the purchase price remaining after the down payment (and any carryback financing) when the existing loan will not be assumed by the buyer. 1.1 Lender’s Name: Enter the name of the lender who is willing to make a loan secured by the property. 1.2 Lender’s Contact Information: Enter the lender’s mailing address, email address, phone/fax number and contact person. 1.3 Loan Type: Enter the loan type, noting whether it is an adjustable rate mortgage (ARM), 15-Year Fixed Rate, 30-Year Fixed Rate, or other type. 1.4 Loan Amount: Enter the dollar amount the lender has indicated it would lend on the property to a qualified buyer for funding the purchase of the property. 1.5 Interest Rate: Enter the annual rate of interest sought by the lender. 1.6 Monthly Payment: Enter the anticipated amount of the buyer’s monthly payments on the loan. Click the “Online Calculator” link for an online amortization calculator to compute this amount. 1.7 Amortization Period (Months): Enter as a number of months the amortization period the lender will use to set the amount of the monthly payments on the loan. 1.8 Loan Due Date: Enter the due date for payoff of the loan. 1.9 Loan to Value (LTV): This figure is the amount of the loan expressed as a percentage of the asking price for the property. It is determined by dividing the loan amount by the asking price. 1.10 Prepayment Penalty Expiration: Enter the expiration date beyond which a prepayment penalty will not be charged on a payoff of the loan. 2 EXISTING LOAN INFORMATION: Fill in the data fields addressing the note and trust deed which now encumbers the property if the seller will permit the buyer to assume the loan. 2.1 Lender’s Name: Enter the name of the lender holding or servicing the existing financing. 2.2 Lender’s Contact Information: Enter the lender or servicer’s mailing address, email address, and phone/fax number. 2.3 Loan Type: Enter the loan type, whether it is an adjustable rate mortgage (ARM), 15-Year Fixed Rate, 30-Year Fixed Rate, or other type of loan. 2.4 Loan Amount: Enter the remaining balance due on the loan. 2.5 Interest Rate: Enter the annual rate of interest charged on the loan. 2.6 Monthly Payment: Enter the amount of the monthly payments paid on the loan. Click the “Online Calculator” link for an online amortization calculator to compute this amount. 2.7 Amortization Period (Months): Enter as a number of months the lender will use to set the monthly payment. 2.8 Loan Due Date: Enter any due date and amount of any final/balloon payment of the loan. 2.9 Loan to Value (LTV): This figure is the amount of the loan expressed as a percentage of the asking price for the property. It is determined by dividing the mortgage loan amount by the asking price. 2.10 Assumption Fee: Enter the dollar amount of any assumption fees to be charged by the existing lender. 2.11 Prepayment Penalty Expiration: Enter the expiration date beyond which a prepayment penalty will not be charged on a payoff of the loan. CARRYBACK NOTE: Fill in the data fields for any carryback financing. 3.1 Note Amount: Enter the dollar amount of the carryback note. 3.2 Interest Rate: Enter the interest rate for the carryback note. 3.3 Monthly Payment: Enter the amount of the monthly payments to be paid on the carryback note. Click the “Online Calculator” link for an online amortization calculator to compute this amount. 3.4 Amortization Period (Months): Enter as a number of months the amortization period for the monthly payments on the carryback note. 3.5 Loan Due: Enter any due date and the amount of the final/balloon payment on the carryback note. 3.6 Loan to Value (LTV): This figure is the based on the total amount of the seller carryback note and any prior trust deed note and stated as a percentage of the asking price for the property. It is determined by dividing the seller carryback amount by the asking price. LOAN(s) COSTS: Enter the fee charged by the lender to process a loan application. 1 Points/Discount: Enter the amount to be paid by the buyer for points on origination of the loan. 2 Origination Fees: Enter the origination fee charged by the lender. 3 Loan(s) Escrow Fees: Enter the total amount of fees the buyer will pay for loan escrow services. 4 Title Insurance Premium: Enter the premium the buyer will pay for the lender’s policy of title insurance for the loan. 5 TOTAL Loan(s) Costs: The total of all loan closing costs (lines 1-4) is calculated here. 1 Anticipated Closing Date: Enter the date or time period by which escrow is expected to close on a sale. 2 City/County Fees: Enter the total amount of all fees to be paid by the buyer to the local city and county on the sale of the property. 3 Lender’s Title Insurance Policy: Enter the dollar amount to be paid by the buyer for any title insurance policy required by the lender. 4 Title Policy Endorsements: Enter the dollar amount of additional title insurance coverage required by the lender on the loan for the property financed. 5 Hazard Insurance Premium: Enter the total amount of the property insurance premium. 6 Property Survey Engineer: Enter the dollar amount to be paid by the buyer for a survey of the property required by the lender or title company and performed by a licensed civil engineer. 7 Prorated Property Tax: Enter the dollar amount of any property taxes which have been prepaid for a period after the scheduled close of escrow. 8 Month-End Interest: Enter the dollar amount of interest that will accrue after the close of escrow through the end of the month of closing which the buyer will have to pay the lender on closing. 9 Private Mortgage Insurance (PMI): Enter the dollar amount of the premium to be paid by the buyer for any mortgage default insurance the lender will require for the new loan. 10 Flood Certification: Enter the cost for the flood certification the lender is required to obtain. 11 Loan Document Preparation: Enter the dollar amount of the lender’s charge for loan document preparation. 12 Escrow Fee and Charges: Enter the dollar amount of the purchase escrow fee the buyer is to pay. 13 Appraisal Fee: Enter the dollar amount to be paid by the buyer for an appraisal of the property. 14 Legal Fee for Closing: Enter the dollar amount of legal fees charged for a closing to be paid by the buyer. 15 Loan Origination Charges: This dollar amount is the total charge the buyer will incur for originating a new loan or assuming an existing loan on the property. 16 Loan Points/Discount: Enter the dollar amount the buyer will pay in points or a discount on the origination of the loan. 17 Investor Funding Fee: Enter the dollar amount of the fee charged by the lender funding the loan. 18 Recording Fees: Enter the total dollar amount of the fees the County Recorder and other government entities will charge for recording documents for any new loan, or in connection with the title arrangements other than the deed from the seller. 19 Inspections and Reports: Enter the dollar amount of fees to be paid by the buyer for any inspections of the property prior to its purchase. 20 Tax Service: Enter the dollar amount of the fee the lender is charging for annual tax service reporting on the status of the property taxes. 21 Courier Fee: Enter the dollar amount of any courier fees to be incurred by escrow, title or lender in the closing of the purchase transaction. 22 Other Fee: Enter the type and dollar amount of any additional transaction costs to be paid by the buyer. 23 Non-itemized Approximate: Enter the estimated amount of the total transaction costs to be paid by the buyer. 24 TOTAL Transactional Costs: This dollar amount is the total of lines 2-23, and represents the buyer’s total anticipated transactional costs associated with the acquisition of the property paid through escrow services. 1 Scheduled Rental Income: This dollar amount is the total potential income from rents for all the property’s rentable space and units, forecast for one year forward as though the property were fully occupied. This amount is based on rent paid as scheduled on existing rental and lease agreements for occupied space and units, and market rental rates for vacancies. It is the agent’s duty to ascertain the accuracy and reliability of these rents, since accurate rental forecasts are necessary if multipliers and capitalization rates are to be meaningful tools for buyers to use when setting the value of the property. Scheduled Rental Income is calculated on IPB Form 7: Rent Roll. 1.1 Vacancies, Discounts and Non-Payments: This figure accounts for income lost due to the rate of vacancies, space and units currently let at a discount or with other monetary concessions, and non-payment of rent, and is necessary since the scheduled rental income figure will never actually be fully received. Often this amount is labeled a vacancy factor and is stated as a percentage of scheduled rents based on local market conditions. 1.2 Effective Rental Income: Line 1 minus 1.1. This subtotal is the amount of rent the property will actually generate during a one year period for the use and occupancy of the property, before including other income received for providing real estate related services. 1.3 Other Income: This amount represents any additional income received within a one year period for services provided to tenants or others. These services include such items as the rental of furnishings, utilities/common area maintenance (CAMs), cleaning services, coin operated machines, late payment charges, screening fees and other service fees which are not attributed to rents paid for use and occupancy of the property. 2 Gross Operating Income: Lines 1 through 1.3. This total is the bottom-line income figure giving the anticipated bankable income from all sources that the property operations can be expected to generate over a 12 month period, from which expenses are paid, mortgage payments are made and a profit is earned. Gross Operating Income is also sometimes called Gross Revenue (a bookkeeping term). 2. Annual Interest Accrued and Paid: Enter the amount of interest on loans which will accrue and be paid monthly by the buyer. 2.1 Prepaid Interest Accrued: Enter the pro rata amount of interest which will be prepaid on a new loan in the form of discounts, origination fees and PMI and accrue annually over the life of the loan. 3 Cost Basis on Acquisition: Enter the total cost of acquisition as comprised of the asking price and all other costs associated with a buyer’s acquisition of the property. This amount is equal to the Total Cost of Acquisition on IPB Form 4: Price and Terms. 3.1 % Value of Improvements: Enter the percentage figure the improvements represent as their portion of the cost basis on acquisition. Information on the value of improvements is entered on IPB Form 2: Property Improvements. 3.2 Depreciable Cost Basis: Enter the dollar amount representing the allocation of the cost basis to the depreciable improvements on the property based on the percentage figure given at section 2.1 above. 3.3 Cost Recovery Period (In Years): Check the 27.5, 39 or 40 year box to indicate the period of years the buyer will depreciate the property. 27.5 or 40 years apply to residential property. 39 or 40 years apply to nonresidential property. 3.4 Annual Depreciation Deduction Allowance: Enter the dollar amount representing one years’ allocation of the depreciable cost basis at 2.2 above based on the cost recovery period selected at section 2.3 above. The Depreciation Deduction Allowance is that portion of the NOI which is received by the property owner without taxation since it represents a return of the original investment, including the down payment, funding from purchase-assist loans and basis carried forward in a tax-deferred transaction. 4 Reportable Income (or Loss): The total reportable deductions from NOI is automatically calculated as the total of the interest accrued and paid (section 1), prepaid interest accrued (section 1.1) and the annual depreciation deduction allowance (section 2.4). Monthly Rental Income: For data and information based on current operating conditions (as indicated by the checked box above), enter the amount of rent paid by existing tenants for occupied units and space and the current market rent for vacant units and space. For data based on forecasts of anticipated future operations, enter the rents anticipated to be paid for all units and space one year forward. Rental income data must be accurate, since it is used to establish the property’s scheduled annual income and eventually the property’s value. Column 1: Enter the number or letter identifying each unit or space located on the property. Column 2: Enter the dollar amount paid as rent for each unit or space presently occupied by a tenant. If the unit or space is vacant, enter its fair market rental rate. For forecasts of rents to be received one year forward, enter the dollar amount of rent anticipated for each unit and space. Column 3: Enter the length of the tenancy held by existing tenants on each occupied unit or space, stating it as either a monthly-to-month (MTM) tenancy (either under a rental agreement or an expired lease agreement), or the length of a lease as the number of months (#mos) or years (#yrs) the unit or space was originally leased. Column 4: Enter the date the lease expires for all units and spaces occupied by tenants under unexpired lease agreements. Column 5: Enter the total dollar amount of both the security deposit balance and the prepaid rent held by the owner on each unit and space presently occupied, excluding rent prepaid for the current month. Column 6: Enter information for each unit and space indicating whether rent for any period of occupancy under a lease was reduced, waived or discounted at any time during the term of the lease. Column 7: Enter the amount of rent delinquent and unpaid for each unit or space, excluding rent delinquent for the current month. Annual Operating Expenses: Enter the amount spent annually on each of the listed items, as well as any unlisted current or anticipated expenses. Check the appropriate box to indicate whether the expense entries are based on current or anticipated operations of the property. Current providers of all listed services are disclosed on IPB Form 6-1: Disclosure of Providers. % Column: This column represents the amount of each listed expense as a percentage of the property’s scheduled rental income. Scheduled Rental Income is set forth on IPB Form 7: Rent Roll. 25 Total Operating Expense: The sum of lines 1-22. This dollar amount represents the total annual cost projected or anticipated to maintain and operate the property for one year. 26 Annual Inflation Adjustment: This dollar amount is the future annual increase anticipated for the property’s total operating expenses. This figure is used to project operating expense increases in years following the current one-year period, typically based on the current or anticipated rate of inflation. Disclosure of Providers: Enter the names and contact information for the service providers currently used by the owner or known by the agent. This information ensures the buyer’s access to providers that are familiar with the property. Article: Client Q&A: What is an Income Property Brokerage (IPB) marketing package?